"A serial killer on the loose leaves very unsettling clues." WHISPERS OF THE DEAD, which is the second book in the Special Tracking Unit series written by Spencer Kope, is a book that I'm sure you will not forget. Unlike how most crimes are solved, this one relies on one of the special agents' secret gifts, the 'shine.' When I hear about the 'shine' I think of Stephen King, but this series is a whole different genre. It is not a horror story, but a FBI thriller with a serial killer. Magnus "Step" Craig, along with his partner Jimmy Donovan, is called to investigate a pair of severed feet that was found in a cooler at the house of a Federal Judge in El Paso. They are called to this case because Step is good at tracking with his "gift" that only two others know about, one being his partner. The gift is the 'shine.' He is able to see color where people touch and each person gives off a certain color. He can also tell if a certain color is that of a deceased person. Soon, there is another victim found, also in a cooler. Will they be able to find the Ice Box Killer before they strike again? 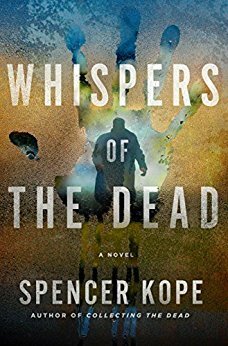 I enjoyed this thriller, WHISPERS OF THE DEAD, by Spencer Kope. I did not read the first book in the Special Tracking Unit series, however I was able to pick right up with this second one. As a reader that loves thrillers and mysteries, I highly recommend this one to those that love these types of novels!